It comes at no surprise that Venice is one of the most attractive cities in the world to visit. With it's combination of gothic and Byzantine architecture sewn together with ancient waterways, the city looks like a painting that's been brought to life. Upon stepping out of the train station (a 2.5 hour ride from Milan), the beauty of the city will take you back and leave you second guessing your two night stay. Don't worry, 48 hours will give you all the time you need to experience the magic of Venice, while still leave you wanting more. So here are some of my 'must do' recommendations while there! 1// go for the Gondola Ride. As cliche as it seems, a gondola ride through the Grand Canal is one bucket list experience that will not disappoint! It's a surreal feeling gliding through twisted canals, passed ancient architecture and under narrow bridges. Most gondolas offer a 40 minute ride for 80 euro and you can find them down just about every waterway. Upon arriving to Venice, this was one of the first things my boyfriend, Cj, and I did and it set the mood for the rest of our time in Italy. You'll want to document the whole experience with videos or photos, but don't. If this is your first gondola ride, take just a few photos and then put your camera and phone down to experience the rest of the ride with no distractions. 2// Grab Drinks at a bar on the Grand Canal. Time in Italy seems to move slower - take advantage of this. Feel out the vibes and find a spot outside to stop for drinks near the Grand Canal. Let the world completely pass by you and enjoy the company you're with and the views that surround you. Take note of what others are drinking and ask your waiter for any special cocktails on the menu. It's always fun to try something new! 3// Explore Shops and Discover Local Craftsmanship. 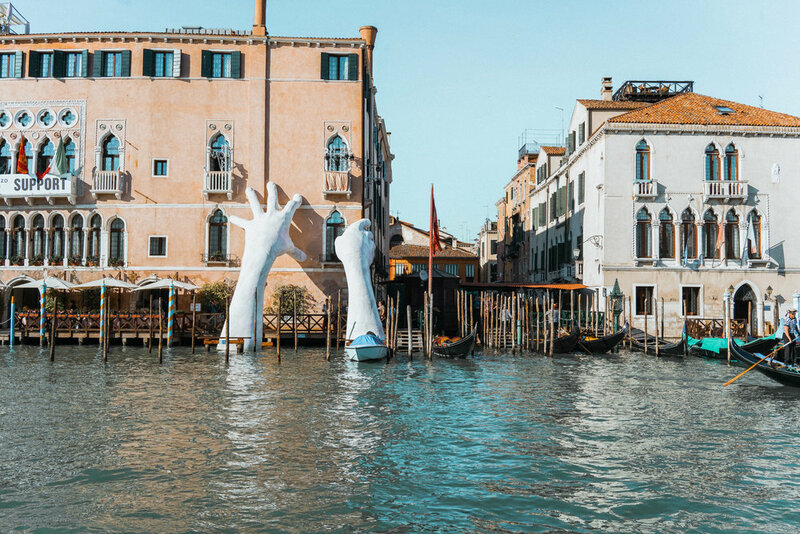 Italians are widely known for their art and craftsmanship and Venice is amongst one of the greatest cities to witness this. Take your time browsing through the markets and small shops to appreciate the handmade venetian goods. If shopping for souvenirs, consider a mask or famous Murano glass. 4// slip into something nice and go for a Candlelit Dinner. I don't think any other culture has mastered romance quite like Italy. So when planning your trip, be sure to pack your favorite evening dress or button down shirt and treat yourself/your travel partner to an intimate night out. At night, the city is still with only the subtle sound of oars moving through the water and the faint playing of an accordion. Start off the meal with the house red and a fresh basket of bread. Unfortunately, not everything in Venice will be magic. Because the city attracts so many tourists from all around the world, many restaurants that you'll find on the main roads cater to these tourists. Luckily, it's easy to identify overpriced and mediocre restaurants. The key is the menu. You'll want to avoid restaurants with several languages on their menu, as well as photos of the food. Also be careful of recommendations from your hotel staff - sometimes they partner with these mediocre restaurants to promote them. My biggest tip would be to keep a look out for restaurants with Italian as the main (if not only) language on the menu, and do your research! If you're trying to keep track of your trail, good luck! You will get lost in Venice and that's half the fun. Every alley way and canal will intrigue your curiosity. Come prepared with good walking shoes and a water bottle and just trust your sense of direction. There's something fascinating to see around every corner. 5// Take a Trip to Murano & Burano. After having spent your first 24 hours exploring Venice, grab breakfast as you find your way to the closest ferry dock. Take a boat ride out to two of Venice's famous islands: Murano and Burano. The ferry will first stop in Murano, which is known for glass blowing and creating some of the most beautiful glass structures in the world. Stroll through the many shops as you wait for your transfer to Burano. Burano is famously known for their bright colorful homes that line the canals of the small island. Grab lunch here and spend the afternoon, once again, getting lost. You'll feel like you're wandering through your favorite childhood storybook. Venice became one of Cj and my favorite new cities. We went with no expectations and were left in awe by mystery and beauty of the city. We didn't get the chance to see everything, but we loved everything we saw. Don't get too caught up on seeing everything either. When in Italy, nothing is meant to be rushed, and everything is meant to be enjoyed.